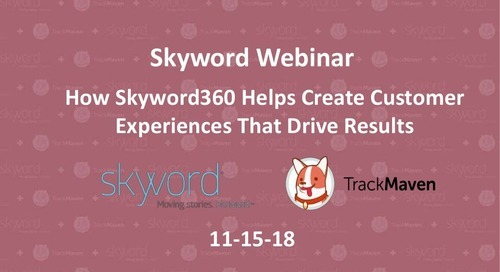 Offering 360-degree views of the entire enterprise, Skyword360 is the only content marketing platform that combines enterprise-wide visibility and planning with original content creation, distribution, and optimization. Now, you can fuel marketing across channels, divisions, regions, and countries with a consistent, relevant brand story. With TrackMaven's industry benchmarking and insights into the content planning process, you'll have the ability to combine best-in-class analytics with best-in-class content marketing. Consolidate content marketing software across your organization to create unique, synchronized customer experiences that drive measurable results.